2.Select Add to Favorites from the pop-up menu. 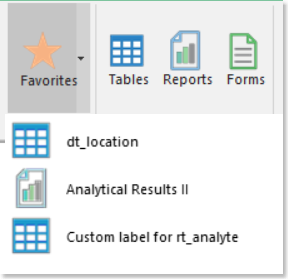 3.Type a value for Name. 1.Click Create in and select the parent folder ie. Favorites. 2.Click New Folder in the AddFavorite window. 3.Type the name of the folder and click OK then OK again. The selected item is added to the Favorites list. To access the list, click Favorites on the Home ribbon. Note: The ability to add Form Favorites is coming soon with a future release of EQuIS Professional. 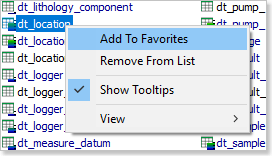 To remove items from EQuIS Professional Favorites, right-click on an item from the Favorites list and select Remove From Favorites from the menu.